Pre-K has been working hard the last 6 weeks of November and December! We have really started meshing together as a group and building meaningful relationships with one another. We finished learning about our families and ourselves. We made many charts and graphs that discussed how many siblings, how many people and who are in our families. We also made our first self portrait and decorated a full body cutout with a face using loose parts. Our families had to guess who were were using clues about our favorites and our self portrait. Other fun November activities we did were opening and exploring a pumpkin and roasting and eating the seeds. They were yummy! We took some time to talk about being thankful and grateful and how it ties in to our continuous kindness campaign. We drew pictures and wrote a message to our specials teacher and the office staff to express how grateful we are for them. We will spread more love in January when discussing Martin Luther King Jr’s message. After completing our All About Me study we moved on to our School Study. We learned about communities and the different people, neighborhoods, and places that make up our communities. After exploring our NYC neighborhood from a bird’s eye view, we explored our school with a straight POV. We studied our classroom and created a classroom map. We learned that there are many parts of the school that are on every floor like, clocks, fire extinguishers, bathrooms, and water fountains to name a few. We also learned which grades are on each floor and who are the people that make our school function. We also learned that the rooms on each floor start with the number of the floor it is on, for example, 204 is on the second floor. 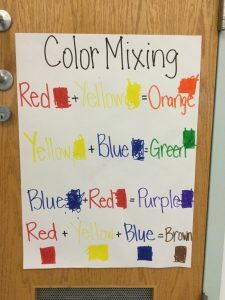 This helped us chart the classrooms and people in our school. During December we naturally started showing our interest in familiar stories and recreating these stories. 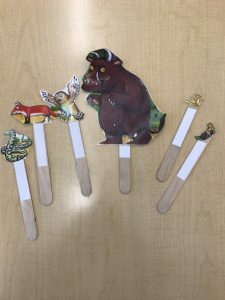 We started to create materials like scenery and stick puppets so that we can set up and put on a show. We also started creating our own books in art choice, by using staplers and tape to put together paper in book form. We will continue storytelling and build upon it in a Theater/Show study starting in January. We had many discussions about holiday plans and the different celebrations each of the students celebrates in our class. The children had much to say and naturally began these conversations. It was lovely to hear about family traditions through the perspective of a 4-year-old. It has been an exciting month in Pre-K! We have more than settled into our routines and we are starting to really up our play. It is becoming more complex and it is starting reflect our experiences and knowledge of the world around us. 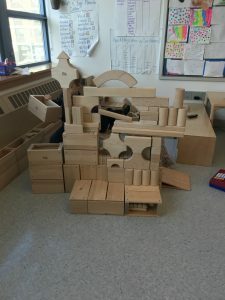 We were gifted a register for the Imagination Play area and we have been making money to put inside and it has boosted our play helping to spark different [play scenarios like restaurant and store. Our artwork is becoming more detailed and we have started cutting and gluing more. 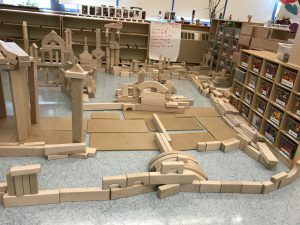 We have been working in teams to complete complicated puzzles and have built an entire block city! We are really coming together as a classroom community. We have been focusing on learning about ourselves. 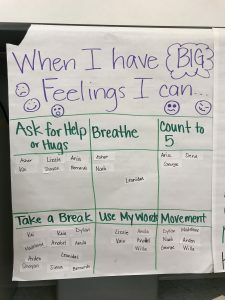 We started talking about strategies for calming big feelings and understanding having feelings is ok, but negative reactions are not (i,e, hitting, yelling, throwing). 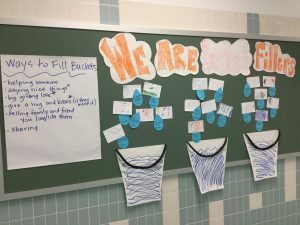 This also continued our bucket filling work on kindness. Next we learned and shared our name stories and studied our names. We counted how many letters in each child’s name and then we used this information to make different graphs and charts to categorize the information. 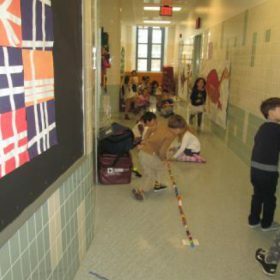 We learned and practiced how to compare length, count 1-1, and language about size (big, medium, small, long, short. Along with this we explored name puzzles and our name cards helping us to learn how to write our names. We also shared our favorite animal, color, and food and Melysa turned them into an All About Us book. We read several books about learning to embrace ourselves to build self esteem and confidence. These books are listed under resources. We read them and talked about how to get along with others, how to express different feelings, and the things about us that make us the same yet unique. We discussed different ways to say hello in different languages. We explicitly learned about the features of our face and head. We talked about placement of eyes, eyebrows, nose, mouth, ears, hair etc… We practiced by making an interactive face where we each took turns to draw a feature. Then we started our first self portraits. We also talked about special features like fingerprints that make us unique. Melysa inked our fingerprints and we will place them on our body cut out that we decorate with our features. We are still working on this project. While we work on this project we will transition to learning about family and discussing our family dynamics and traditions and how our family is our first community. During October we also started library with Sarah. We are really enjoying looking at different books and choosing one to bring back to the classroom. We love to look at them during transition times. We also love to askl Travis and Melysa to read one during lunch and end of day story times. 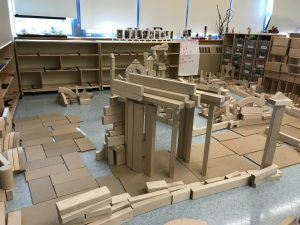 We also opened the block area where we have really found a building rhythm. This last week of the month we kept our structure up and built upon it throughout the week. We emptied ALL the block shelves! Also this month we started our first cooking projects. We made applesauce and banana bread in the classroom and enjoyed eating both as an afternoon snack. This month we will make pumpkin bread and banana cookies – we have a lot of bananas to use! Start show and share where we can bring an item from home to share with the class. 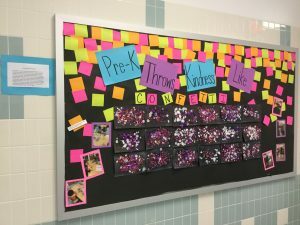 Draw pictures for all the other classrooms to help continue our kindness throwing campaign. Take a few walks to collect natural items and to look at the building in the neighborhood for block building inspiration and to discuss our neighborhood community. 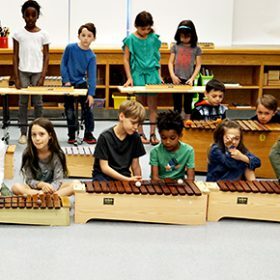 New songs we have been singing and moving to posted in resources along with a few photos! So Far in Pre-K 204…. 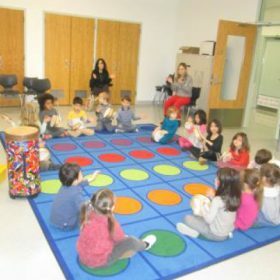 The children have learned new and familiar songs to move and dance to. They have a routine of moving to Baby Shark, We are the dinosaurs, Purple Stew, Silly Bear Hunt, Monkey Bananas, & Moon Moon Moon. For song links click Resources in the navigation bar to the left. They have also learned 7 yoga moves: Dog, Tree, Lion, Snake, Frog, Butterfly, and Mountain. Along with yoga moves, the children are working on mindful breathing. They take deep breaths filling their belly like a balloon and pushing the air out of the balloon when blowing out. We have mastered our hello and goodbye songs, transition songs, and we are learning the days of the week song. We will only build from here! 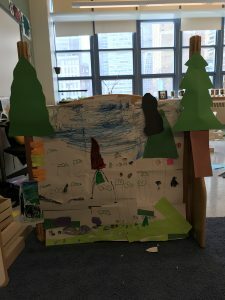 The children are beginning to explore the light table, art, paint, sensory table, loose parts, imagination play, and many of the other manipulatives in the room. 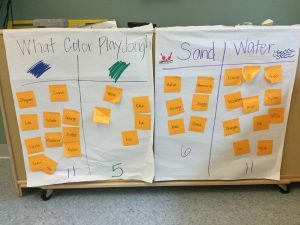 The children are beginning to take ownership of their classroom by doing votes on classroom decisions (like playdough color and what goes in the sensory bin). They have also been helping to make classroom charts and storytelling props. 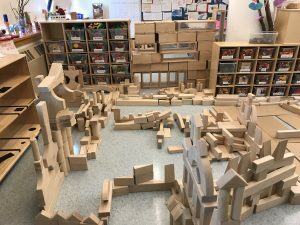 Blocks will open next week and we will really dive into open play during morning work time and more closed play during afternoon work time. We have also started our reading buddies! The students met Marianna and Victoria’s third graders who came down to our classroom to read to them. Bill Gordh has visited 2 times already and will continue to visit 2x monthly for the remainder of the year. The children have learned their specials teachers names and are adjusting to those routines as well. Because the children have adjusted so well overall, we have been able to jump into content learning. 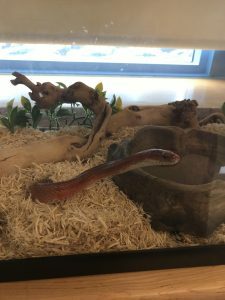 We have started with basic snake care and beginning ideas about snakes like: how they eat, what they eat, their environment, and that they use their tongue to smell. The children have been so great treating Selu (Say-Loo) like a member of our classroom community. After we learned basic snake facts we have moved on to learning about ourselves. Children are sharing their favorites like, color, food, and animals with the class. They have also been introduced to their names with opportunities to trace it and work on learning to write it. From here the children will learn about their name story (look out for an email about this), how many letters are in their names and working with name puzzles. 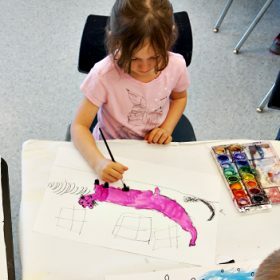 It will move into self portraits and talking about facial features and how they are the same and different. This will also lead into and work alongside learning about family where we will talk about who is in our family and what family means to us. Finally we celebrated our first classroom birthdays, Melysa and George! 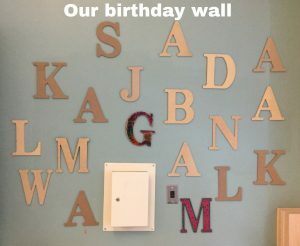 They were the first people to start coloring the letters on the wall. Each child has a letter and when it is someone’s birthday the child will decorate the letter. By the end of the year all letters will decorated and help to make our classroom beautiful. Phew! Pre-K 204 has done SO MUCH already and will only continue to get better. It is shaping up to be a fantastic year. Mark your calendar for 10/26 and 12/7! These will be our Family Fridays for the first half of the year. They will start at 8:25am. These dates have also posted in the Save the Date category in the navigation bar on the left hand side of the webpage.